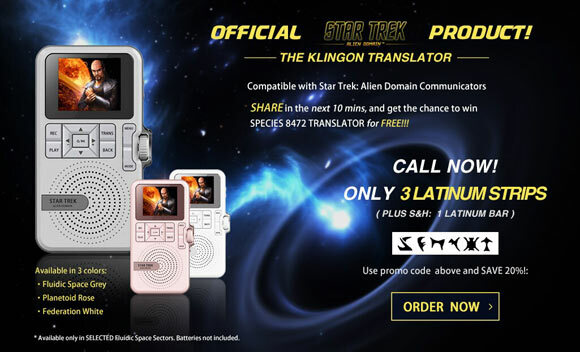 Star Trek™: Alien Domain reveals revolutionary new Klingon translation device! Captain of a FEDERATION STARSHIP? Having difficulty learning the language that may accidentally, if you say the wrong thing, land you in a battle to the death? Well look no further CAPTAIN! You can now throw away those petty Klingon Language courses and get The STAR TREK: ALIEN DOMAIN KLINGON TRANSLATOR! Take the KLINGON TRANSLATOR with you to the final frontier and explore FLUIDIC SPACE! For only 3 Latinum Strips you can translate KLINGON instantly! No software courses required! Enter your Captain’s Log in Klingon! * Product does not guarantee results of negotiations.